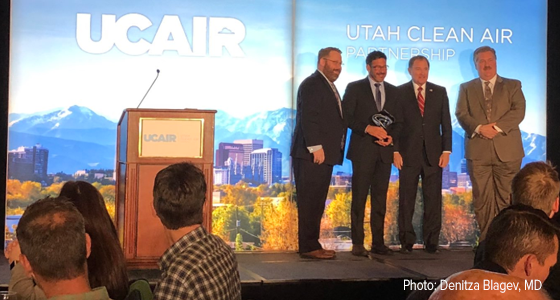 The Utah Clean Air Partnership (UCAIR) has named Health Care Climate Council member Intermountain Healthcare its 2019 Community Partner of the Year. Gov. Gary Herbert presented the award to Intermountain CEO Dr. Marc Harrison at the fourth annual Show UCAIR Summit in February. Intermountain and UCAIR have been partners since the clean air organization’s creation more than five years ago. UCAIR said Intermountain was named partner of the year because of their transition to a fleet of clean-fuel vehicles, their promotion of idle-free campuses, and the education they provide to clinicians and patients about the impacts of air quality on health. Intermountain Healthcare is a Utah-based not-for-profit system of 23 hospitals, 170 clinics, a medical group with close to 2,300 employed physicians and advanced practice clinicians. They are a member of the Health Care Climate Council and have committed to the Health Care Climate Challenge.